Mr. Tim Greer teaches a Detective Fiction lesson on identifying bite marks. Students in Mr. Tim Greer’s Detective Fiction classes have benefitted from their teacher’s longtime fascination with Sherlock Holmes, developing critical thinking and writing skills through literature study and hands-on crime-fighting labs. His passions for sleuthing and teaching recently yielded another benefit: The Beacon Society, a New York City Sherlock Holmes literary group, honored Greer with the 2014 Beacon Award. The society, a scion of the eminent Sherlockian group The Baker Street Irregulars, annually recognizes one teacher whose exemplary educational experiences introduce young people to Arthur Conan Doyle’s detective stories. According to Greer, director of theater and English instructor, the world still needs Sherlock Holmes, a detective who seeks justice for the victim but also for society. Classroom discussions range from Aristotle’s Metaphysics and “the insatiable human desire to know,” to recurring themes in detective fiction, such as justice, revenge, obsession, the nature of truth, the rule of law, and the burden of genius. The class is not all theory, however: Greer’s students record their findings in field notebooks as they analyze bite marks, forgery, and gunshot residue and conduct a manhunt using a bloodhound on campus. In these activities the students follow in the footsteps of Doyle’s iconic character Sherlock Holmes, recreating the investigations in stories such as “The Reigate Squires” and The Sign of Four. An avid reader all his life, Greer has had plenty of time to research his course materials. He read his first detective fiction story when he was 5, and he knew he was hooked on Holmes when his copy of The Best of Sherlock Holmes (Watermill Press, 1980) fell apart from sheer use a few years later. Greer traveled to New York City in January to accept the award, presented during the annual meeting of The Beacon Society at The Roosevelt Hotel. 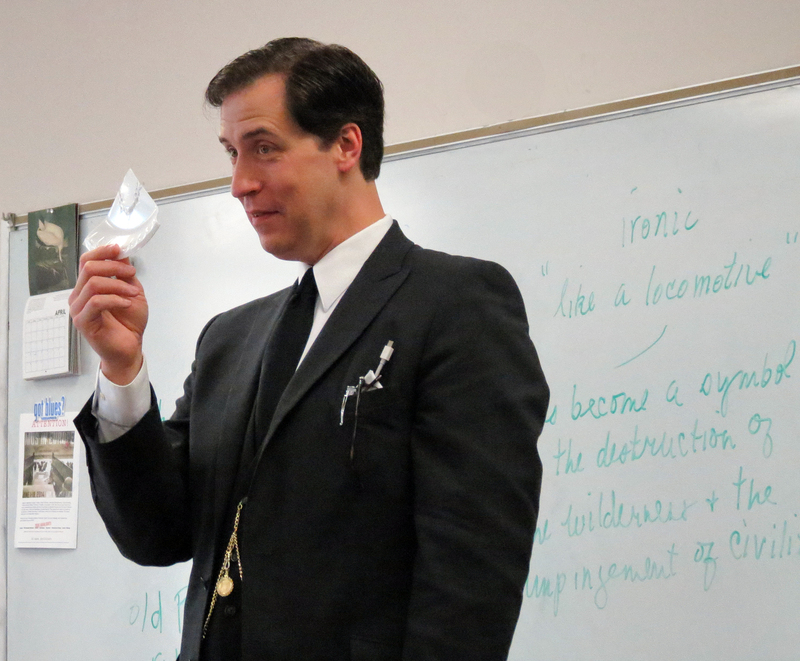 Find an article and photos from Greer’s Detective Fiction class here.